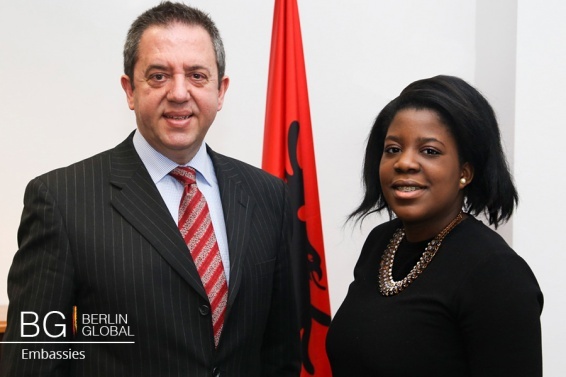 On the 31st of March 2016, we had the honor to sit down with Albanian ambassador to Germany H. E. Amb. Artur Kuko. He welcomed us in his office at Friedrichstraße 231 Berlin. We discussed the Albanian transition from a dictatorship to a democracy, Albania´s official candidate membership to the European Union and promoting the Albanian culture in Germany. You studied International relations at Tirana University and also completed your postgraduate studies there. What influenced your decision to study international relations? What advice would you give young people today who are thinking about entering into the diplomatic field? I have always been interested in this field. I wanted to modestly contribute to make my country and the world a better place. The advice that I would give to the young people today is to keep on dreaming and that they have to dream big and work hard so that their dreams come true. I saw that last month (9.02.2016) you were part of a discussion on the topic: “Modern Albania: From Dictatorship to Democracy”. What do you think were the most important milestones that shaped this transition? Well thank you very much for mentioning this, I was part of a discussion in promoting this wonderfully written book by my good friend Fred Abrahams here in Berlin. It’s a nice and relatively accurate snapshot of the process that moved Albania from dictatorship to a democracy. It is by and large a very long and complex process. Albania as you might know, was the last country of the Eastern European countries, to step out of the dictatorship and pass into a democratic system. From this point, in international terms, I have been lucky and privileged to be part of almost every important milestone of the journey of Albania. I was there as part of our delegation, when Albania became a member of the council of Europe. I was also there when Albania signed the first institutional agreement with the European Community at that time a Trade and Cooperation agreement. I was also part of the Albanian team that negotiated the Stabilization Association agreement during 2003-2007. Last but not least I was fortunate to witness of the flag hoisting for Albania at NATO H.Q. when we became members of the North Atlantic Treaty Organization in 2009. Our transition was, as I told you, a rather prolonged and complex process, but it is moving in the right direction. Albania has clearly made a lot of changes in recent history and now is currently an official candidate for membership to the EU, what further steps do you think are the most important to ensure accession is granted? We are very much aware that becoming a member of the European Union is a difficult and a merits-based task. It is a task that demands lots of reforms, reforms are not always sweet and nice, sometimes they are bitter and difficult. But we are fully convinced that we need those reforms, not simply to make the country a member of the European Union, but to make the country a better place, to make our democracy more vivid and functional and to guarantee a higher standard of living for our people. The reforms we are undertaking create synergy with the efforts of bringing the country closer to the European Union. We are now a candidate country. Our ambition is to get a date and start accession negotiations to become a member of the European Union. Again a process that will be neither short, nor easy. It will take a lot of efforts. Homework should be done internally and be presented to the European Union. We are very closely working with the European Commission, they have identified 5 key priorities in which we need to progress. The five keys that have been given by the Commission are: to complete the ongoing judicial reform, to ensure a solid administration, fight against organized crime, fight against corruption as well as the protection and promotion of human rights in line with the EU’s acquis. So we have to work on these points, before the Commission takes a decision to recommend to the member nations to start the accession negotiations. I’m optimistic that we will be able, within this year, to get a positive recommendation by the European Commission and then it’s up to the member countries to consider the recommendations of the European Commission and authorize the Commission to start negotiations with Albania. The country is moving in the right direction although not in a very rosy environment. The region is experiencing difficulties, first of all because of the economic crisis and financial difficulties that have involved most of the surrounding nations, including those who are already members of the European Union. Secondly the refugee crisis is affecting the region. Nevertheless, if someone takes a moving picture of were the region stands now and where it stood even 5 years ago, you can see a huge difference and I can confirm that the region is also moving in the right direction. It wouldn’t be fair if I wouldn’t mention the irreplaceable role that Federal Republic of Germany has played in this regard. It was at the invitation of Chancellor Merkel that the Prime Ministers of the Western Balkans convened here in Berlin in August 2014. They gave a start to what is now known as the ´Berlin Process´, a process, which not only strengthens the complex of the relations among the nations of the region, but also contributes to strengthen the relations amongst the nations of the Western Balkan and the EU. A second conference took place last year in Vienna. We are looking forward to the next stage, with the Conference that will be taking place in Paris in July this year. Not only internal tasks need to be fulfilled but also regional cooperation is an irreplaceable criteria, in which we need all to contribute in order to bring the whole region towards the European Union, always based on individual merits of the nations concerned. During your political career you have been appointed as head of mission to the EU and to NATO and also as Ambassador to Belgium. Such high political positions bring also many difficult situations. When and which decision in your political career was one of the most difficult? It’s difficult to say, because every post comes with its own difficulties. The more difficult it is the more professional fulfillment it gives you in the end of the day. The year 1997 was probably was the most difficult part of my political career. The country was in turmoil, I was accredited to the European Union and I had to represent the country in a very difficult period of its history, trying hard to get the support of the European Community at that time. Another important period was the Kosovo crisis I was ambassador to NATO at that time. NATO was quite active not simply on military terms, but also on humanitarian grounds. That was a difficult, but fascinating period of my diplomatic career. How do you look on the refugee crisis that is facing Europe and Germany as well? The refugee crisis is a complex one with serious political, social, security, financial and institutional repercussions European wide. If I take a step back and comment a little bit in general about it, it’s a crisis that is threatening the very foundations of the European Institutions as we know them. Just to mention one of them, we have taken for granted the Schengen Agreement, which provides that people can move freely from one EU-nation to another, the free movement of capitals, merchandise and goods. The refugee crisis has the potential to affect the Schengen rules and therefore it needs tremendous care. I would comment from a very modest position, since Albania has had no massive arrival of refugees in our territory, but nevertheless we are following the events with tremendous attention. We have expressed our willingness to, in case of need, be part of any European plan. With regards to cultural diplomacy as a tool to achieve conflict resolutions and peace? Can you give us an example of a time during which you were involved in successful cultural dialogue? I could think of a lot of events, but I remain of the opinion, that communication and building bridges of communication in general including human contacts and cultural exchanges are the best ways to make people and nations understand, that throughout their history they have created many prejudices against each other. So if you look at the cultural dimension in the Western Balkan, you cannot but note that there are so many similarities. They more or less share the same admiration for culture. They also share the same appreciation for creations of artistic nature and therefore I like putting culture as an element of promoting relations between countries. Here in Germany, we are modestly trying to do whatever we can to promote the Albanian culture. In a couple of weeks, we will be organizing a photography exhibition. The aim of the exhibition is to show photography in Albania, as it existed in the early years of the 20th century. But there is much more that we can do. I could refer to cultural exchanges between Albania and Serbia and between Kosovo and Serbia. History has brought these nations in severe conflicts. By promoting culture, you bring people together and by bringing people together you contribute to avoid misunderstanding and prejudices that people might have had. During the conference of Berlin Process in Vienna last year, one of the deliverables that was identified is that we need to strengthen cooperation between the youth. 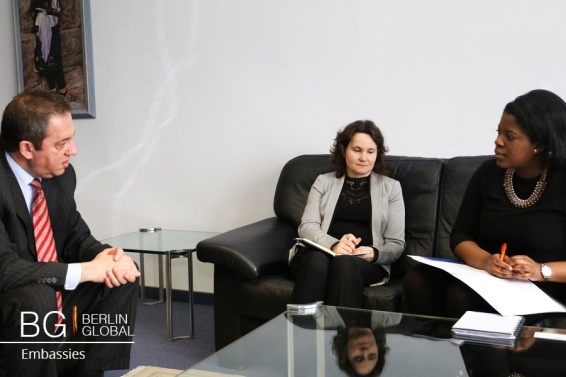 We had the opportunity to refer to the German French Youth Cooperation. It was a successful cooperation and all the countries in the region picked-up on this French German cooperation as a good example to be followed by the Western Balkans Nations. How is the Embassy of Albania promoting Albanian culture in Germany? Due to a substantial contribution of our Honorary Consulate in NRW, we have had last year some very good events in the region of Nordrhein-Westfalen, these events involved making Albania known by its traditions and customs. The events were also about the new input that Albania is able to bring to the European culture in particular in the German framework. We are lucky and fortunate to have very distinguished representatives of the Albanian culture here in Germany. Ervis Gega is a very gifted violist of Albanian origin, who plays throughout Germany and she has helped to make a good contribution for Albanian culture. Besides that, we were part of the promotion of another renowned Albanian artist Saimir Pirgu, who is a tenor singer. He was recently here in Berlin to promote his last CD compilation and he will be back in May with another performance. I could also refer Anri Sala, another renowned Albanian artist, who resides here in Berlin and he also promotes art and culture. He has also contributed to make Albania better known culturally. Albania has a strong relationship with Germany. Since November 2015 you have a new cultural agreement, which supports cooperation between universities and promotes scholarship and exchange programs. In what way do you think education can be used as a tool to strengthen your relationship further? I refer to the agreement mostly on cultural ground, but it definitely also has a very important educational agreement. The best investment we can make is in the brains of people and education comes with that. I would be interested to see as many as possible students from Albania studying in Germany. I would also be interested to see as many educational exchanges between both countries. I have seen an increase in the domain of relations between educational institutions. Last week we had a visit of a team of the Hamburg University in Albania. They are trying to scan the horizon and see what the present situation is in Albania, with regards to professional education. We want to improve the cooperation on those grounds with Germany. By the way, on 18 April 2016, the cultural department of the Albanian Embassy in Berlin will organize an exhibition entitled "499 965" with some very rare cultural and historical photos of Marubi studio. There will be exposed 35 from the collection of about half a million photos taken from the pioneers of Albanian Photography, in the years 1858 - 1940. It is the very first time we will expose this Albanian heritage in Germany. You are kindly invited to visit us!